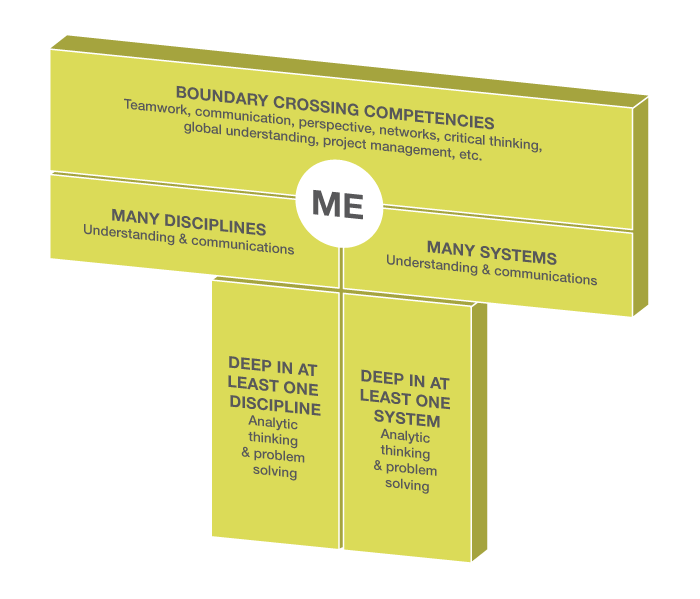 Colleges and T-Shaped Training: Build it and They Will Learn? Though the idea of T-shaped management is gaining traction on American campuses, there are some important roadblocks along the way. Some of those roadblocks are ivy covered. In some ways, the relationship between colleges and major tech corporations is beginning to look a bit like ju jitsu. Ju jitsu, roughly translated, means that when you get pushed, pull, and when you get pulled, push. In principle, most business colleges clearly want better partnerships with major corporations. Most colleges accept the importance of using business analytics, T-shaping their students, and embrace change when it comes to education, at least in concept. In reality, however, change seems to move at a glacial pace in the halls of higher learning. Academic resistance to T-shaped training often seems to be over matters of control, and fears about giving it up. It is true that the enormous potential influence of corporate technology giants, who are donating massive sums of money and expecting nothing less than drastic changes in what universities teach, cannot be overlooked. While Bill and Melinda Gates are not the only major influence on university reforms, they are big enough to have a gravitational effect. In the context of their almost $500 million in donations to universities, this is to be expected. In a July, 2013 article, The Chronicle of Higher Education (which has also received Gates Foundation support) noted that the bulk of these donations (over $300 million) have come in since 2008. That’s a lot of money. And a lot of influence. Working through the University of Southern New Hampshire and taking online course work, students are assessed in such areas as “logic, reasoning, and analysis,” which help the student solve real-world business problems. Everyone seems to like the potential of this approach: except for entrenched college executives. In the movie Field of Dreams, the apparently crazy idea of turning a cornfield into a baseball field is justified based on the mantra, “Build it, and they will come.” The threat to American competitiveness, in terms of highly desirable T-shaped employee skills, is that there is a whole lot of T-building going on — elsewhere in the world. Until recently, Poland’s national education system was widely perceived as falling apart, regarded as suitable only for low-trained, low-tech, and low-paying jobs. This view changed with the successful adoption of innovative T-shaped education strategies there. Interestingly enough, critics of the Gates approach have claimed the Gates Foundation is approaching the “problem” as something that “engineering” can measure (through technical algorithms) and fix . Yet the Gates Foundation seems to be hewing very closely to the Polish model of making T-shaped students. We know through example that it works. Confusing the necessity for a better, T-shaped core curriculum with the need to accurately measure that curriculum is confusing cause and effect. The lesson for America from Poland is the benefit of every college developing a core curriculum that leverages that specific institution’s unique offerings in such a way to develop T-shaped skills. The shift from a traditional, “I” shaped curriculum to a T-shaped one is very much in evidence in what the Gates Foundation has done with the Southern University of New Hampshire. Whether crossing that “I” to get a “T” will happen in the next decade or not may rest on the influence of a new era of outside-the-box, dotcom entrepreneurs. Will it be enough for the U.S. to compete globally? Or will it be too little, too late? We shall see. One college president believes that the way to solve the education crisis lies not in the classroom, but within “innovation zones” that encourage experimentation and invite the prospect of failure as a pathway to success. That’s not something you hear every day among academics, is it? The panelist spoke at IBM/Michigan State University #tsummit2014, held at IBM’s research center in Aladmen, California, which I had the pleasure of attending this year. Over 200 business leaders and higher education institutions attended to discuss skills for the 21st century. A variety of thought-provoking panels, speakers and discussions made for an informative and entertaining conference. The focus was not on meeting today’s employment demands (a popular topic of discussion among parents and in the media), but on a longer-term view of producing students for the global economy of the future. One of the event’s panels, which consisted of college presidents, provided for a lively, candid discussion on what is needed to prepare students for the economy of tomorrow. They all seemed to agree that education’s center of gravity will be outside the classroom, not in it. One of the presidents described his vision of an “array of high impact learning experiences that are not defined exclusively by traditional measures or approaches.” As the president pointed out, we now have content available in formats “that don’t require it to be written in scrolls.” How best to take advantage of this? Despite the conventional wisdom, all in higher education are not merely whistling and twiddling their thumbs when it comes to confronting these important challenges. Some promising developments are under way. One is so the College for America Program at Southern New Hampshire University. Approved by the Department of Education in 2013, this is the first degree program in the country that is competency-base, offering a degree based not on credit hours or courses, but on direct assessment of student learning – a profound change. SNHU President Paul LeBlanc said the program was inspired in part by Muhammad Yunus, a social entrepreneur who was awarded the Nobel Peace Prize for founding the Grameen Bank and pioneering the concepts of microcredit and microfinance. LeBlanc wondered what would happen if they asked the same sort of outside-the-box questions at SHNU. “Rather than using the credit hour in which time is fixed and learning is the variable, what if we could flip that? What if the university changed the business model? What if we went to a mentoring model? What if we could find other resource than text box for materials? What about the length of class?” The result was the College for America. If a new hire can articulate and demonstrate their skills and knowledge through presentations, analysis and collaboration, is the end result a better predictor for success on the job than a high GPA? Time will tell, but we will need to follow up on the University of Pennsylvania Health Systems, Partners Healthcare System in Massachusetts, ConAgra Food and Dunkin Donuts, as all have signed on to support the College for America program. Another college president made the point that we need a “different kind of innovator” now and in the future, one who understands complexity, a concept he said is completely overlooked in conventional engineering programs. A narrow, focused, nose-to-the-grindstone view of the world has resulted in countless innovations in the past, he said, but also countless unintended consequences. Climate change, for example. T-shaped education is part of the solution, the president said, enabling students to span a variety of disciplines and have conversations with people in very different places right from the start. It’s easier to learn how to do that – to talk to people who are disciplinary experts in different fields — when you are young than it is when you are in mid-career, just as it’s easier to learn how speak Spanish if you’re five than when you’re 45. Students are “wet cement” when they’re young. So we need to consider educating within the T-shaped paradigm earlier, rather than later, he maintained. Another panelist defined innovation as the process of generating original ideas and insights that have value and then implementing them in a way that changes many peoples’ lives. Without implementation, he said, it’s not an innovation. It’s just a cool idea. A genuinely profound innovation is an innovation that changes the world so dramatically that you can’t remember what it was like before it happened. Electricity, the automobile, the airplane, the Internet, radio, and television are all such examples. They had an impact not merely because they were great ideas, but because people used them. Last year, the president said, the percentage of bachelor’s degrees in the U.S. that were awarded to students studying engineering in any university – 4.5 percent, a declining market share. In Europe it’s about 12 percent. In Asia it’s about 30 percent. What are we going to do in ten years when the U.S. number drops to, say, one percent? In addition, the number of students who find what we define as “engineering attractive” is not great, he said. About half of all students who begin studying engineering last fall won’t graduate in engineering – a big hole in the pipeline. In addition, only 18 percent of the students who graduate in engineering are women, another big gap.